North West cricket suffered another blow this week, with the news that former All Ireland winners Limavady CC have decided to withdraw from the union. The Roeside Cricket Club have announced that they have been forced to withdraw from the North West league with immediate effect - bringing to an end the story of one of the Union's most successful members. The writing has probably been on the wall since the club opted to drop into the Qualifying Divisions at the end of the 2012 season, but the determination of people like Johnnie Hunter, Ivor Lapsley, Ivan McMichael and Ian McCloskey managed to keep things afloat until now. The unfortunate passing of stalwart Johnnie Hunter last year hasn't helped their cause and despite their best efforts, Ivor Lapsley confirmed that Limavady had come to the end of the road. 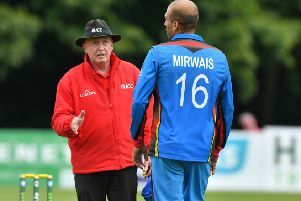 "We've been struggling for a while to get a team out week to week, to be completely honest," he stated to Cricket Europe Ireland. "It was a bit of a struggle to get to the end of the season but we plugged on and decided that we would sit down and look at the situation realistically when this summer was over. "That's exactly what we did and the fact is, we just don't have anything like the numbers to keep going." "Of course it's a massive disappointment but we had to be realistic. It's the end of an era that it was a pleasure to be a part of." The Roesiders were the dominant force not just in the North West but throughout Ireland for a spell in the late 90's and early 00's- culminating in their capture of the senior treble of league, cup and All-Ireland in a unique 1997 season. The likes of Decker Curry, Stephen Smyth, Ian McGregor, Ricky McDaid, Mark McDaid and overseas players including Kamran Akmal, Jaideep Narse and Agha Sabir graced the Hunter Memorial Grounds in those days as Limavady claimed 7 senior cup wins, 9 league titles (including 7 in a row) and 2 All-Ireland titles in the space of 10 years. Things have of course been much leaner since that 2012 development, however it goes without saying that the loss of Limavady from the local Union will still be keenly felt. A spokesman for the North West said that they were disappointed by the developments and paid tribute to the club's contribution to the Union's history. "It is obviously a sad day for North West cricket and for the sport in the Roe Valley in particular. "Limavady's outstanding achievements will stand the test of time and we would pay tribute not just to those involved in the golden years, but also those who fought hard to keep the club afloat since. "We will of course continue to look for ways to keep young people coming into the sport in the Roe Valley as we do with every other part of the region."